This study was conducted as a part of the Vétérinaires Sans Frontières Europa Development Education Program. It is concerning the sensitization of students, general public, farmers and policy makers on the importance of Small Scale Livestock Farming in the context of climate variability. The study shows that small scale livestock farming has a potential to cope with and adapt to climatic variability, especially in some determined regions in the world. Moreover, due to its specific functions, small scale livestock farming can also be considered as an important way to mitigate carbon emissions from livestock sector. This Program is currently being executed in five countries, with members of the VSF-Europa network, namely Agronomes et Vétérinaires Sans Frontière (France), SIVTRO (Italy), VSF Belgium, VSF Czech Republic and VSF Norway. This study can be considered as a take-off for a campaign that will run for over 3 years and that will sensitize and mobilize people in favour of small scale livestock farming. Worldwide, livestock production is an activity that allows people to eat meat, milk- related products or eggs. Additionally, livestock has traditionally provided of leather for shoes or clothes, of energy in the form of work to plough the soil or simply to transport people long distances. In many regions, livestock is an essential component of the livelihood of the community and is also a necessary complement of the agricultural activity: animals eat plants in rangelands that cannot otherwise be consumed or cultivated and produce organic fertilizer in the form of manure. They also are a key component in maintaining natural landscapes in many areas. Small scale livestock farming (SSLF) is probably the best example of the long-term traditional balance between human being, livestock and agriculture with nature, a system in which each component obtains a benefit. The complexity and variety is enormous: thousands of domestic species adapted to many different geoclimatic contexts. During the last century other forms of growing livestock have been developed, in which livestock farming is considered an industrial activity in a global economy of scale separated from agriculture. Each system has different characteristics, different stakeholders, different beneficiaries, different positive and negative impacts on society and the environment, and is affected differently by agricultural, development or environmental policies, including those for mitigation and adaptation to climate change (CC). Climate change poses new challenges to agriculture, particularly as regards land use and the food supply. For years it has been out of the food policy agenda, both for policy-makers and social movements. However, the discussions of climate change in and after the 2009 United Nations Framework Convention on Climate Change in Copenhagen, and the publication of scientific data showing the importance of the agri-food system as net emitor of green house gases, have increased the interest on the existing interactions between climate change and the food system. Together with other factors, such as world demographic growth, peak oil, agrofuel production, rising food market speculation and land grabs, climate change pushes agriculture and livestock farming towards a new era of major uncertainties and shocks (Almas et al., 2011). The instability of the global agri-food system is apparent and new solutions are urgently required. Since the FAO Livestock’s Long Shadow Report in 2006 (Steinfeld et al., 2006), there has been an important increase in research regarding the importance of livestock for food security, the growth suffered by the sector, and the impact on CC (HLPE, 2011; Development Fund /Utviklingsfondet, 2010; Bennett et al., 2006; Hancock, 2006). Researchers worldwide investigate the role of livestock in CC, showing both the role of livestock in climate change and the effects of climate change on livestock production, and study alternatives for mitigation and adaptation. But most of the proposals do not considerate the fact that different livestock systems require of different policies and actions. For instance, they tend to present solutions based on new technologies to reduce emissions (mitigation) using top-down approaches, focused primarily in industrialized productions systems. On the other hand, many studies are dedicated to SSLF alone, but almost none address its relation with CC, including mitigation and adaptation strategies. Only few attempts have been done to develop the issue of CC and livestock that differentiates among industrial large-scale livestock farming and SSLF (IUCN and WISP, 2010; Rivera-Ferre, 2010). This study was conducted as a part of the Vétérinaires Sans Frontières Europa Development Education Program, funded by the European Commission (DEVCO), AFD, Région Rhône-Alpes and DGD. The Development Education Program, is currently being executed in five countries, with members of the VSF-Europa network, namely Agronomes et Vétérinaires Sans Frontière (France), SIVTRO (Italy), VSF Belgium, VSF Czech Republic and VSF Norway. This report aims at contributing to this lack of information. The main objective is to contextualize the role played by small scale livestock farming into the climate change debate and its potential contribution to food security. The hypotheses of this study is that small scale livestock farming can contribute to mitigation of climate change and needs to be taken into consideration into the policy discussions, and that autonomous adaptation of local communities, mostly based on local traditional knowledge, can be a reliable group of adaptation measures to climate change while at the same time contribute to global food security. The questions that this report aims to address can be summarized as follows: (i) how SSLF systems are sustainable and could contribute to mitigate climate change; (ii) how they are ‘efficient’ at producing animal source foods for the growing populations and contribute to future food security challenges; (iii) how the ‘traditional’ options to reduce the impact of livestock farming on climate change are consistent or inconsistent with SSLF communities, and more particularly with pastoral livelihoods. 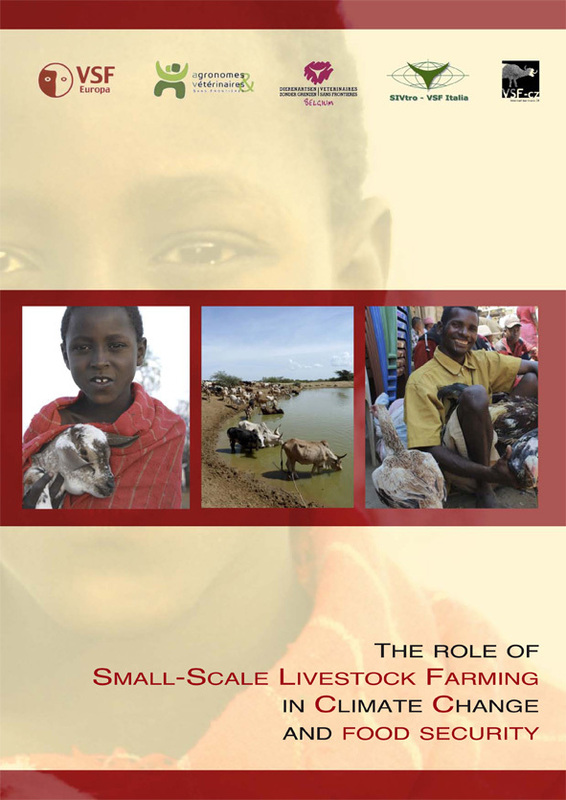 Along this report we will illustrate how small-scale livestock farming, and particularly pastoralism, may play an important role in these new solutions required. SSLF is important to the food security of millions of people today and will be important to the food security of millions more in the coming decades in a context of climate variability. To address these issues the report first proposes a different categorization of livestock production systems, going a step further than conventional categories. Our attempt is to introduce in the classification process not only the inputs utilized by different livestock farming systems, but to link this with the scale of each type of production system, so as to add a food system approach to the categories. Later the report critically assesses the existing literature in terms of livestock production and mitigation alternatives. Finally, based on a field work carried out in four case studies, it presents the adaptation measures undertaken by small scale livestock farming communities in Turkana (Kenya), Alaotra Lake (Madagascar), Khar-o-Touran (Iran) and Huancavelica (Peru), as well as the main socio-economic drivers intensifying the CC’s effects they encounter, which hinder their adaptation strategies. These adaptation measures are first assessed, both identifying the main obstacles they meet, and their potential maladaptations in each case. Main conclusions, togther with some recommendations to policy-makers are proposed in a final section.